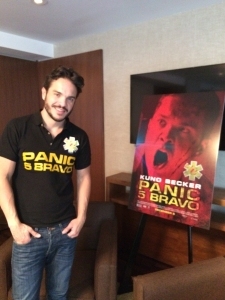 On Dec. 5, the AMC Theater in Cicero showed for the first and only time Kuno Becker’s directorial debut movie “Panic 5 Bravo.” The movie is an action-thriller film about American paramedics that become trapped on the Mexican side of the border and terrorized by a violent psychopath. The idea for the movie was inspired by a real incident when Becker was in Mexico shooting a documentary in an ambulance with the Red Cross when he encountered a tragic situation of a badly injured man on the Mexican border and the code was 5 Bravo. “Seeing that changed something in me,” said Becker. Becker is also happy that he had the right team behind him to pull the movie in such a short time. “People have to have faith in you. I am happy to have the cast that I did. They believed in me and that makes me very grateful,” said Becker. But Becker isn’t only trying to show his talent as a director with this movie. He also is trying to send a message and make a change. “I want to end the violence that is going on in Mexico. I want to do that by trying to create characters that people will remember. That is challenging,” said Becker.